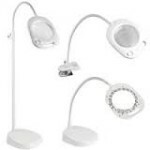 PURElite 3 in 1 Magnifying Lamp can be used as a floor lamp, a table lamp or a clip-on lamp. The bulbs of the multipurpose lamp create a near daylight effect. This makes them excellent for reading and as a study light. It offers natural light as well as magnification. And best of all, long life lightbulb…in other words you will never need to change a bulb for the lifetime of this lamp! Also can be plugged into the mains electrical system or used on a battery. Also supplied with a 15cm optical magnifying glass lens with 2x magnification. This lamp has been designed so it can be used as a floor lamp, a table lamp, or a clip-on desk lamp. There is a choice of either mains power or battery operation. The lamp, in any of its forms, can be used anywhere! An optical quality 15cm magnifying lens provides clear 2x magnification, and is fixed to a flexible ‘swan’ neck for precise and easy positioning. Magnifying glass to help if your eye sight is not 20-20 or to help with modeling, sewing or any other hobby that requires precision. Being both battery and mains operated means that it can be used anywhere at any time. Converts into three different types of light. Completely adaptable. 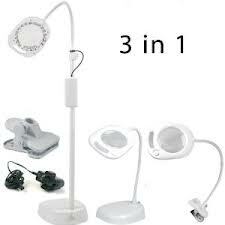 Buy the PURElite 3 in 1 Magnifying Lamp now. Only just received the product, it was easy to assemble and the light is good it is far more effective than a normal room light for reading and close work. Bought for elderly friend with eyesight problems reading. He is delighted with the product, finds reading easier and loves its flexibility of use.